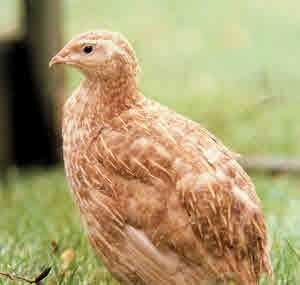 This is essentially the same breed as other strains of Coturnix laying quail, but has been developed as a separate variety with golden colouring. The male is lighter while the female is darker and more striated. She also has distinctive brown stripes around the face. The gene for gold colouring is dominant. Thus, a Gold crossed with a normal Coturnix type will produce mainly gold young, and a few brown feathered ones, in the ratio of 2:1. It is worth bearing in mind that two doses of the gold gene are associated with a lethal condition, with up to 25% of the eggs failing to hatch. In the USA, golden strains known as Manchurian Gold were developed by Marsh Farms. Various Golds there have been bred for the table and eggs. In Britain and Europe, Italian or Golden Italian is the name given to the golden variety. This is slightly smaller than the normal type and is kept predominantly as an egg layer. 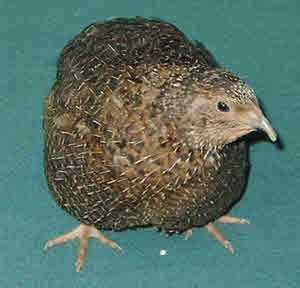 It should be added that with Italian, and indeed with any other strain of Coturnix quail, too much in-breeding is to be avoided. An infusion of fresh blood, with a system of careful breeding and upgrading (bearing in mind the comments about lethal gene combinations) would be a positive step. The overall colouring is dark brown, so that some people refer to them as Brown quail. This is a mistake however, for the Brown quail is the name normally given to the Australian breed which is bigger and more greyish in appearance. However, there is a similarity and it is possible that Australian settlers introduced the Common quail to that Continent, with subsequent isolated development producing apparently different sub-species. The markings of the Range are essentially a lighter brown body colour overlaid with darker-brown, almost black pencilling, along with a certain amount of dark grey feathering on the back and as a faint patch on the throat. In America, the Range Coturnix, is referred to as the British Range, while in the UK, we sometimes call it the American Range! 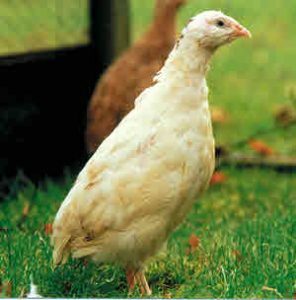 The overall appearance is dark-brown while the striped head markings are similar to other Coturnix breeds. However, the white eyebrow stripe and white throat markings are virtually absent. Beak and legs are olive-brown and eyes, dark brown. The brown plumage is the result of a dominant gene. This is one of my favourites. 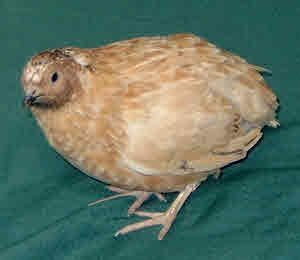 Essentially like all the other Coturnix breeds, the overall impression of the Fawn is a lovely warm pinkish-brown. The fawn feathers are pencilled with white and the white eyebrow lines are present, although not as strongly defined as in other breeds. Beak and legs are light pinkish-brown, and eyes are dark brown. There is no colour difference between the sexes, although as in other breeds, the female is slightly bigger than the male. In the USA, there is a similar variety called the American Fawn or the American Spotted Fawn. Sometimes called English White, good specimens are completely white, with no discernible markings, other than on the head. Beak and legs are pinkish brown and eyes are dark brown. Male and female are identical, although the female is larger. It is common to have patches of black on the head and back. Breeders who are aiming for all-white specimens can breed this out with careful selective breeding, but beware! White is regarded as a recessive gene, but in recent years, an incompletely dominant albino gene has also been reported. So, it is important to remember that too much emphasis on trying to produce an all-white bird may produce unwanted albinos. This is an apt name for a bird with a smart white waistcoat to contrast with its dark brown overcoat. The two-colour pied pattern is the result of a crossing between the dominant dark brown and recessive white genes. The colour of the back feathers is identical with those of the Range, while the white plumage is like that of the English White. The markings are often variable. The ideal ones are clear white face, chest and belly, with dark brown back, tail and crown. In good specimens, the brown and white feathering is neatly demarcated, but it is common to find patches of white where the brown should be, and vice versa. In recent years, crossings and mutations have also produced a range of varying colours, hues and feather patterning, including Cream, Grey, Blue, Grey/Blue, Ginger, Red, and so on. 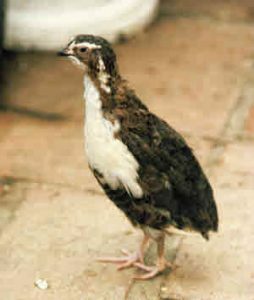 It is important to remember that these strains are all variations of the basic type of Coturnix or Japanese Laying quail, and not separate breeds. 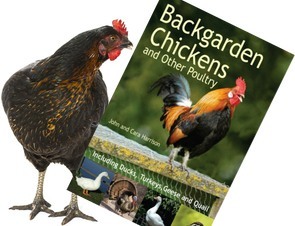 This shortened article is taken from Keeping Quail, 4th Edition, by Katie Thear and used with permission of the publishers.